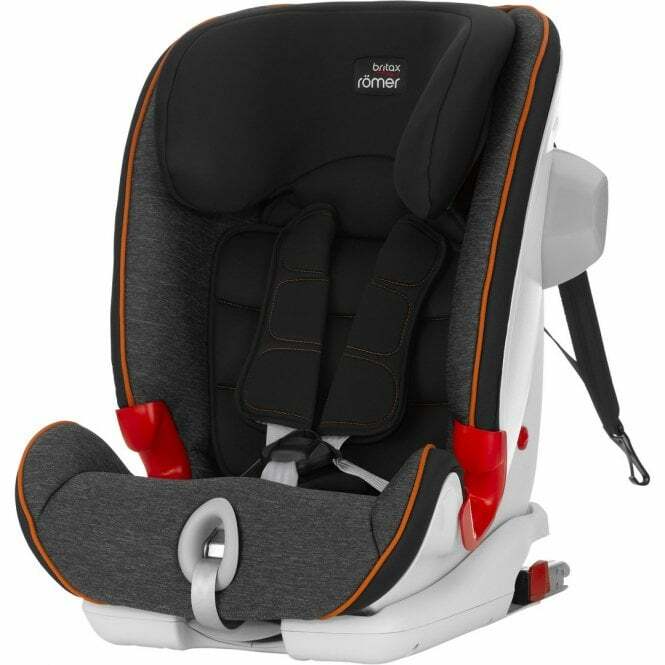 Britax Advansafix III SICT Car Seat is a fantastic Group 1/2/3 Car Seat designed for your growing munchkins from 9kg up to 36kg (or 9 months to 12 years). This ISOfix Car Seat securely clicks into your car with ease, leaving you with hassle free travel! Why should I choose the Britax Advansafix III SICT Car Seat? The Britax Advansafix III SICT Car Seat is an all-round, protective and stylish Group 1/2/3 Car Seat. This car seat can be used as a Group 1 Car Seat with the advanced 5-point safety harness to keep your little monster really secure. Once they have outgrown this stage, out comes the adults belt! This Car Seat converts into a High Back Booster for your child, with the use of your vehicles 3-point seat belt to strap them in. What's more, the Britax Advansafix III SICT Car Seat offers an additional 4th contact point to keep the lap belt at the optimal position for your little one's safety. To convert from a Group 1 Car Seat, Britax have introduced a fantastic new feature. The 'Flip & Grow' allows you to flip from the integral harness to the lap belt strap - easy as pie! You can then strap them in using your car's 3-point seat belt, knowing that they're safe with the protection of Britax's SecureGuard Technology. This car seat exceptionally exceeds legal safety requirements to help give you a peace of mind. Advanced side impact protection (SICT) is a priority with this Group 1/2/3 Car Seat. It helps to completely cushion your munchkin's little head, all whilst absorbing the majority of impact in the event of any collision. The Britax Advansafix III SICT Car Seat is approved for use in recline positions for children of all ages. It includes soft padded side wings which means that if your little one is exhausted after a run around the park, then they can doze off to dreamland whilst you're on your way home! With a Silver award in the Made For Mums Awards UK 2018 under its belt. The Advansafix III SICT is a car seat you can rely on. It features a Britax Pivot Link ISOfix System, which directs any force downwards into the vehicle seat and then forward, more gently. This greatly reduces the risk of head and neck injury for your bubba. This is hugely assisted by the Top Tether with rip-stitch technology, which offers even greater stability! The Britax Advansafix III SICT Car Seat really is a suit of armour for your child. Britax offer a 1 year Manufacturers Warranty on selected products from the initial date of purchase. Applies to UK mainland only. Showing our 8 Britax Advansafix III SICT Car Seat reviews with an average rating of Excellent. Would you like to write a review? Your Review - Brilliant car seat. Your Review - in my opinion, this si the best child seat on the market, Once its fitter there is no play on movement what so ever. I purchased this seat solely because it is so secure once fitted. our Grand child is comfortable and secure in it at all times. Yes its one of the more expensive ones but it worth the extra. Your Review - Perfect for our son!! Your Review - Customer service was excellent. Bought the seat for use in my vehicle for grandson, plenty of space in back of Citroën C4 for seat a dog two passengers. Your Review - 2nd seat ordered from this company.Top notch service.Good quality seat. Although we'd never had an isofix and tether strap car seat before we have found this really to install and move between cars - the green indicators really help when switching too. Great value for money because it's going to last our child until they no longer need a car seat, plus it's one of the safest seats out there.